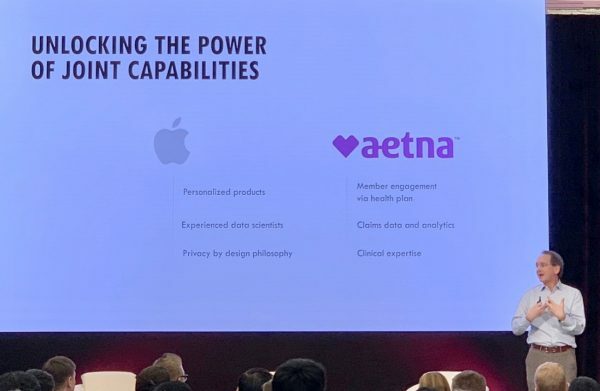 On Tuesday I had the pleasure to be at Aetna – CVS Health’s grand announcement for Attain, an Apple Watch-based app that will be released later this Spring. Aetna and Apple co-developed this application – Aetna providing the healthcare expertise and Apple its user interface chops. Initially, Aetna will promote Attain directly to members, bypassing employer HR departments. It’s a watch-based app built on the theory of “Nudges” to change behavior(s). Wellness goals will initially be set based on age, gender, weight. However, over time Attain will self-adjust and personalize health and wellness goals based on an analysis of member usage patterns to provide meaningful, attainable goals. Attain with Apple Watch benefit is a “loss-framed incentive” program. Most wellness benefit programs are simple gain-incentive based. How it works: Aetna members will be notified of the opportunity to buy an Apple Watch on a monthly payment plan. By using the Attain app on their watch and accumulating points, those points will be applied to paying down the monthly installment. Meet your monthly goals, and no payment needs to be made. Fall short, and the loss-framed incentive kicks in and the member must pay a portion of the monthly bill. Note that both Aetna and Apple were very proactive and firm regarding the steps they will take to ensure the security and privacy of member health data. Aetna will continue to improve security, migrating to gesture-based authentication. Aetna will never use collected data for underwriting, nor will data be used or sold for secondary purposes. Apple, likewise, will only collect de-identified data for improving the app experience if the consumer opts in. There was no discussion as to how Attain will address chronic conditions such as hypertension, diabetes or mental health. The event did not address how Attain might become a platform with open APIs and developer kit to enable others to build disease-specific modules for Attain. Surprisingly, no mention of how Attain might alert a member to care gaps and assist in scheduling an appointment. While hoping for discussions on the above, it is clear that Attain is very much a v1.0 product and future enhancements, including the above, are likely if the app proves successful over course of this initial launch. In a recent report from Rand Europe, there is reason for hope. Aetna has always been a leader among payers in experimenting with new ways to engage their members. No other payer comes close. I really like what Aetna and Apple are doing here together as it truly breaks the mold of traditional approaches and go-to-market strategy to engage members in their health. It is a great first step and truly representative of a healthcare organization seeking to improve the health of the population it serves. In stark contrast is what we will all see in a couple of weeks at HIMSS’19. No health IT vendor has even come close to this level of commitment to patient/consumer engagement with such an easy-to-use, engaging app. And frankly, responsibility for this shortcoming does not rest solely with vendors, but also their provider customers. IT vendors typically build what their market desires (or demands). Despite all the talk of consumer/patient engagement, I’m calling bullsh*t on the providers and the vendors that serve them for not stepping up to the plate and taking consumer/patient health and wellness seriously and making the investments necessary to truly move forward in a meaningful way. So providers and the vendors that serve you – what’s next? Please don’t tell me it is yet another scheduling app that just generates more revenue for you, or an easier way to pay co-pays, or a static filing box of medical records. Seriously, what’s next in the game plan to truly engage patients in a way that is reflective of expected 21st century customer experiences and is truly patient-centric?